Glyn Dillon’s critically acclaimed graphic novel, THE NAO OF BROWN, has won the Best Book prize at this year’s British Comic Awards at Thought Bubble Festival in Leeds, which ended on 24th November. The award was presented by Geek Syndicate’s David Monteith. The winners were selected by a specially chosen panel of judges who this year included TV personality Lenny Henry; Graham Lineham, creator of Father Ted and Black Books; Gareth David, singer from Los Campesinos; Stephen L Holland, comics retailer for Page 45; broadcaster Jamillah Knowles; comedienne Josie Long; and graphic novelist Sarah McIntyre. Published by SelfMadeHero, the UK’s leading independent graphic novel publisher, the book was also the recipient of the prestigious Special Jury prize at this year’s Angoulême International Comics Festival. 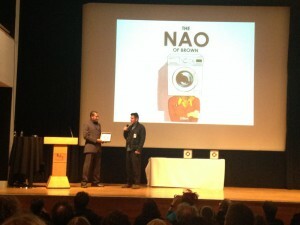 THE NAO OF BROWN has been published in America, France, Spain and Italy where it has become a bestseller. Dave Hine and Mark Stafford’s The Man Who Laughs from SelfMadeHero was also nominated in the ‘Best Book’ category, alongside Stephen Collins’ The Gigantic Beard That Was Evil, Mrs Weber’s Omnibus by Posy Simmonds and the epic Judge Dredd: Trifecta story. Now in its second year, the annual British Comic Awards are a celebration of the best stories told by writers and illustrators in the comics and graphic novel medium.